Greetings from the staff, students and brethren here in Wotutu. I strongly believe that this mail meets you in good health and a sound mind. Thursday evening students, some staff and some members of the Wotutu congregation were en-route to Kumba to mourn with those who mourn as minister Awum Nicholas’ corpse was being removed and transported from Dschang, about 250 miles where he died, as he was struggling to seek admission for his daughter into college. The Students of CBIW were the only ones authorized to carry the casket. Our presence was really uplifting to the saints and many desire to come to CBIW in the next intake. We appreciate God for all His care over us throughout the past month and we are now in October going closer and closer to the end of the year 2011. This year is election year in Cameroon as on the 9th of October there will be presidential election in Cameroon. Keep our country in your prayers for peace to continue. All our programs for the school went on well. Our chapel service was centered on encouraging one another to stand firm. The program was good as many had opportunity to reflect into their life again as they live in this pilgrim world. It was a solemn gathering as members of the churches of Christ all over Cameroon was in attendance. About 300 people came. CBIW students, early in the morning on Friday, arranged the chairs and mounted the canopies for people to sit as rain is still falling here. Our students wore their blue T-shirts welcoming people from far and near and made them comfortable as they await the arrival of the corpse. The students went there with many reasons; to mourn, exhort, encourage and to share the gospel with souls still under the captives of the evil one. Brother Opel Esowe knelt down after the wake keeping service to share the gospel with many. We have planted and we shall go time and again to water and help those Christians there to sit up even though their minister is not there again. 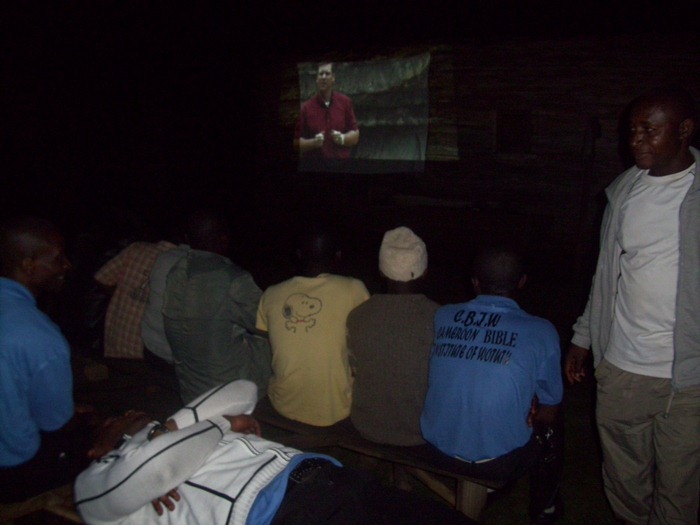 Later after the wake service, we projected DVD from WVBS to entertain people as we wait for the day to come for burial that is the way we do here, so many had the opportunity to listen to the truth through that. The widow stood and was supported by a brother and she stood with a girl whom minister Awum took to Dschang for the admission process. It was a pitiful situation to hear her talk with tears and a heart that is breaking. The family gave me opportunity to say a word which I used to exhort the audience with the word of Job 14:1, talking about our few days. I painted a picture with a question; HOW WE ARE USING OUR FEW DAYS? I exhorted many that we should use our few days wisely investing our all to the services of God just as minister Awum used his throughout his life, since he was converted till the 20 of September where he died. Thanks very much for all your support and your care to us. The work is moving on well. Keep brother Alfred Ayaubo, a student, in your prayers. He sick and is hospitalized in the hospital. He is suffering from diabetes. He is down now for one week plus some days now. We are still planning for the establishment of a new congregation in Botoke village after Limbe. Keep it in your prayers. Posted on October 2, 2011 by Bob Turner and tagged Cameroon.